Even if you’ve never used Adobe's Photoshop software, you’ve almost certainly heard it used as a verb--to "photoshop". Whether it’s making actresses skinnier on the cover of a magazine or cutting out an ex in a family vacation photo, this software has some serious power. 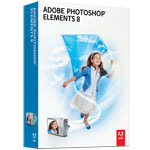 And now, you can do even more with your digital images using the newest consumer version of the product, Photoshop Elements 8. Most of the time pictures just need to be tweaked, and you should head for "Quick Edit." 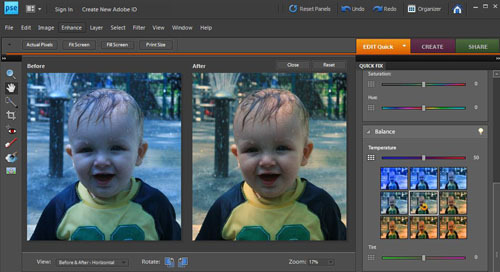 In "Quick Edit" you're presented with a number of sliders, which let you adjust things like color temperature (cool blue or warm red), lighten objects in shadows or sharpen the image so objects look more defined. In the past, this was somewhat trial and error, if you didn't already know what you were doing. For this version, you're presented with nine tiny versions of your photo that show the impact the slider will have on your photo. Click on the one that's closest to perfect, and use the slider to make any final adjustments. In "Full Edit" mode, there's a new tool called "Recompose." It will let you resize images without distortion. So, let’s say you have a landscape photo of your child’s birthday party with all of his friends and you want to change it to a portrait layout. You can do so by selecting what you want to cut out of the photo, then having Photoshop squish the chosen sections (sometimes until they disappear), while leaving the important sections intact. And finally there's a better way to correct exposure. "Photomerge Exposure" lets you combine and under- and over-exposed photo of the same scene to create a perfectly lit, perfectly exposed image. Select the portion of the photo you want to retain from the first photo by drawing over it (see the yellow scribbling), and just that portion will appear in the second photo. 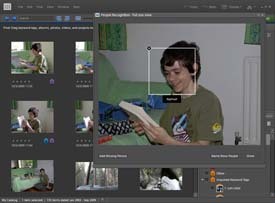 In addition to editing photos, Photoshop Element 8 helps organize images. I don’t know about you, but one of the biggest problems I have with my large digital photo library is trying to find a specific photo. A new tool called Auto Analyzer organizes your imported images by assessing the content and tagging them with keywords called Smart Tags. The Auto Analyzer will determine how many people are in a shot and even tag people, if you've trained it with the "People Recognition" tool to recognize particular faces. It will also assess image quality and tag it as "High Quality," "Low Quality" or "Medium Quality." 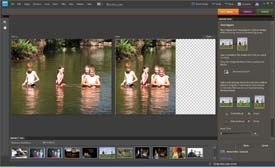 All in all, the new features of Adobe Photoshop Elements 8 are welcome additions to an already excellent photo editing program. Includes 20GB of online storage and exclusive access to tutorials, artwork and templates on an ongoing basis. 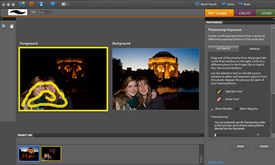 Photo shop continues to serve the photography market with absolute brilliant user friendly application. Although it can be challenging when first using, once you have mastered the basics it is such a joy and pleasure you will wonder what you did without it.